As the game begins, we see the flames of battle, as Duke Bardorba’s manor has been taken over by Mullenkamp cultists, who take his family hostage. The Cardinal’s organisation, the Crimson Blades, launch a counterattack, aiming to destroy the invaders, free the hostages and reclaim the manor. The Valendia Knights of Peace (VKP) send agents Ashley Riot, a Riskbreaker, and Callo Merlose, an Inquisitor, to investigate the situation. The Duke is an incredibly powerful man, holding the parliament in the palm of his hand, Mullenkamp cultists are known for their ruthlessness and dark rituals, and the Cardinal has sent the Crimson Blades without consulting or even informing the VKP. Obviously, many interests are clashing, and, since hostages are involved, the situation is very complicated. As Ashley confronts the Mullenkamp cult leader, Sydney Losstarot, he quickly realises that this won’t be just any ordinary mission… As Sydney escapes, Ashley must follow him towards the ghost city of Lea Monde, the cult’s stronghold. Political intrigue is at the centre of the story, much like in Final Fantasy Tactics. The Ivalice team (Tactics, Vagrant Story, Final Fantasy XII) really likes exploring those themes. Several different parties struggle for power, and the hero is trying to do the right thing in the midst of it all. Mysticism also plays a major role, but it wouldn’t be a Square game without some magic now, would it? 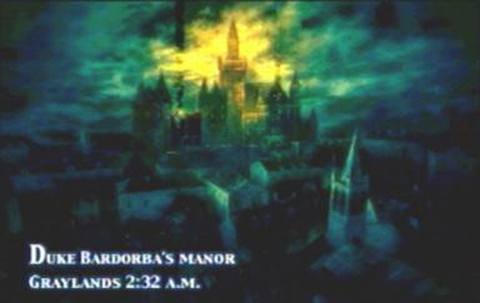 Some of the cutscenes, especially in the beginning, suggest vast potential. Ultimately, the game struggles to keep the “awesome” factor as high as the standard set early on, but it is an ambitious effort nonetheless. Many things remain unclear until the very end, and a few even afterwards. The twists the story takes are really satisfying. As in many great games, things are not exactly the way they seem on the surface. I enjoyed the story a lot, even if at times the gameplay stretches between cutscenes were so long I had to revisit some scenes to remember what had happened beforehand (of course, it also has to be kept in mind that I played through the game over the course of 2-3 months). 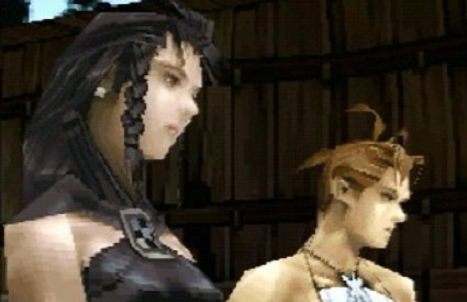 It’s a local conflict – you do not save the world this time, but perhaps that is what gives Vagrant Story some of its unique charm. 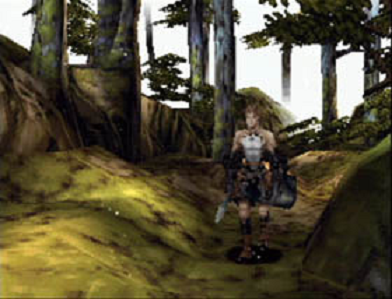 Vagrant Story’s unique structure (dungeon-cutscene-dungeon) practically does not allow for random NPCs, as there is no town roaming. Nevertheless, the game manages to retain a strong cast with a very limited amount of characters involved. The protagonist, Ashley Riot, is a skilled warrior, determine to see his mission to success. He is aided by Callo Merlose, a slender girl who holds the rank of Inquisitor within VKP, but has no battle experience. Ashley, concerned mostly for her safety, leaves her behind and goes on after Sydney on his own. Ashley is a very interesting character, we find out more and more about him as the story unfolds. A hardened fighter, he is not afraid to go after forces that seem supernatural. He is a rather straightforward character, at least for a greater part of the game. But it’s hard not to like him due to his courage, his consideration for his friends and the weak, and his cool one-liners (“I am the reinforcements.”? Cheesy, maybe, but it works in context). Still, he is not a top-tier game character or anything. I certainly wouldn’t put him on the level of the Ivalice team’s earlier protagonist Ramza. Practically, the only real ally Ashley has is Merlose, and the two spend the majority of the game apart. It’s a one-man mission, in every sense of the word. I liked Merlose, as a whole, she certainly has a pretty design, but she didn’t particularly stand out as a support character. The other true stars, aside from Ashley, are the three strong men in their struggle for power – Sydney – the Mullenkamp leader and master of the dark arts, Rosencrantz – the former Riskbreaker who inserts himself solo into the situation for his own personal gain, and Guildenstern – the leader of the Crimson Blades who seeks to destroy the Mullenkamp cult. Sydney, the obvious villain, as the beginning sequence already suggests, is probably the most interesting character in the game, his mysterious powers being a major plot point. After their initial confrontation, he realises what a powerful adversary Ashley is, and that he needs to take him into account for his future plans. The way the relationship between the two develops is quite intriguing. As with every good game villain, Sydney is far from one-dimensional, and many players would surely sympathise with him later on – I know I did. I also liked Sydney’s closest friend Hardin a lot. He really stood out as a sidekick who wouldn’t just follow his partner blindly (something so common in games and other media, especially when we talk bad guys and their henchmen), but would rather think independently on the situations at hand and offer his own suggestions. Hardin and Sydney had a nice contrast between each other, too – as master of the dark arts, Sydney appeared almost non-human, while Hardin showed consideration and care – still without putting his mission in jeopardy – for Duke Bardorba’s son, even if he was his hostage. Rosencrantz and Guildenstern, aside from their names being Hamlet references, add a lot to the game, as well. Rosencrantz, as a former Riskbreaker, is extremely powerful, on par with Ashley. Disillusioned after many battles, he has chosen to cut all ties with military organisations and pursue his own goals. I really liked him and his attitude, he just seemed like a very realistic figure with his thoughts and motivations. The leader of the Cardinal’s Crimson Blades, Guildenstern, is another powerful figure, holding much influence over his troops, and hell-bent on destroying Sydney’s cult. He shows no mercy to those who stand in his path. Unlike Rosencrantz, who believes in nothing but himself anymore, Guildenstern is the kind of person who sees the world in black and white and is certain that his way is the correct one. As such a character, he is hard to like, unless you have acquired that kind of taste. But I appreciated his role in the game, he certainly added a lot. 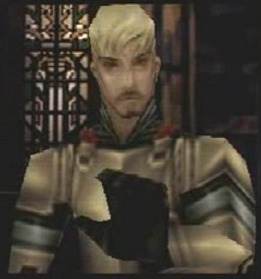 Duke Bardorba and Cardinal Batistum, while powerful political figures in the world of Vagrant Story, do not play particularly active roles in the game. Nevertheless, both are still important to the plot, their actions having influenced the events we see unfold as the game goes on. And much is at stake, for the Duke and, respectively, for the country, as his only son Joshua is being held hostage during the crisis. 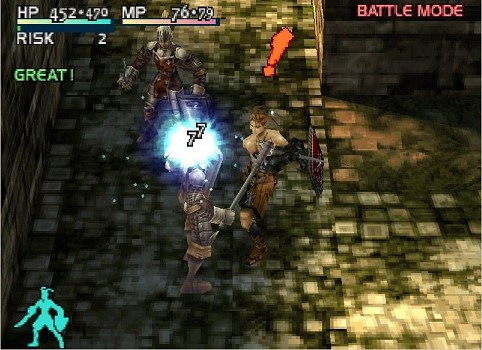 Despite the story being quite outstanding, I dare say the gameplay of Vagrant Story is an even bigger draw. Once you get the hang of it, it starts flowing smoothly and is a real joy. There is platforming, Ashley can jump to higher levels in the room. During a battle, you can attack enemies with your equipped weapon, or open a general menu (which pauses the battle) where you can use a spell, an item, Break Arts (powerful moves associated with a kind of weapon), etc. If you press Circle, which equates to choosing to attack, Ashley draws his weapon and a sphere appears around him, showing you what you can attack, based on the distance to the enemy and the range of your weapon. You can also target different body parts, which sometimes does different damage, depending on the enemy. Also, attacking the same body part a lot causes it to get more susceptible to damage. 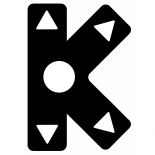 Best of all, just as your hit lands, an exclamation mark appears, allowing you to chain with another attack, as long as you press a button (Square, Triangle or Circle) again before the exclamation mark disappears. Of course, that window of time is very small, but, once you get the hang of it (for instance, you could rely more on what you hear than the exclamation mark you see, as it usually appears right as your hit lands and makes the respective sound), it’s not so hard to chain even 10+ attacks. My personal record was 21, the streak gets harder and harder to maintain with each subsequent hit, as your heartbeat increases with the thrill of having hit many times in a row. It’s a real rush, you should just experience it yourself instead of relying on my explanation here. While your first attack is a “normal” one, the chained ones depend on what you bind the three buttons to. It’s possible to do a percentage of the first attack’s damage (even 100% at the expense of losing some health yourself), to try to inflict a status effect on the enemy, or even to inflict damage to HP or MP depending on how much HP/MP you’ve lost yourself. “Chaining” is also possible when the enemy attacks, except it’s just a single counter-attack as opposed to a chain of hits. Again, you assign three different skills to the three buttons, and those can be reducing or reflecting a percentage of the damage of a certain type or element, as well as healing yourself from some status effects. 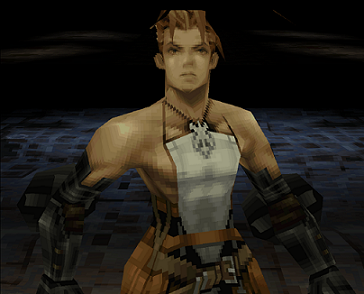 Mastering the “Chain” techniques is absolutely crucial for your success in Vagrant Story. Aside from HP and MP, another important value you need to keep track of is Risk. It increases as you attack or are attacked (chaining increases it greatly), and it decreases as you are out of battle (faster if you sheath your weapon). There are also Risk recovery items. The higher the Risk, the more damage enemies will do as they hit you, and the more powerful your magic will be. High Risk can be useful, as your recovery magic will recover more HP, but it’s pretty bad in general, especially with enemies’ spells that hit more than once. Thus, as a Riskbreaker, Ashley should look to keep his Risk low! 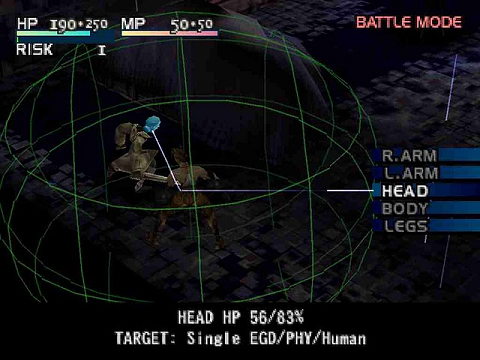 One of the best parts of Vagrant Story, giving the game a great diversity in the way you can play it, is the weapon selection. There are many kinds of weapons – daggers, swords, bows, rapiers, axes, maces… One-handed (leaving the other hand open so you can carry a shield) and two-handed. You can use any weapon you like, and you can switch them at any time. I used the large two-handed battle axe type for 90+% of the game. Weapons get stronger the more you use them, but they also get worn out. Fortunately, there are workshops scattered through the game’s world where you can repair them. At those workshops, you can also assemble new weapons after getting parts from old ones, and add gems that enhance certain affinities of a weapon or shield (breaking a weapon into parts and adding/removing gems does not even require you to be in a workshop). Weapons, armour and accessories also have different affinities towards different enemy types, elements, edged/piercing/blunt weapons, etc. There is also magic in the game, and Ashley can learn spells from items called “Grimoires,” which can be found during his adventures. Healing magic is, of course, crucial, support magic is also quite useful (especially the “Analyze” ability which allows you to see what element/weapon type the enemy is weaker to). In my experience, attacking spells are, unfortunately, quite underpowered, as a decent chain will usually do much more damage to an enemy than an offensive spell costing much MP. Break Arts suffer from the same fate – while flashy and cool to look at, they are just not as effective as they should be. Status effects are also featured in the game, with the nastiest ones being Paralysis (you can’t attack physically), Silence (you can’t cast spells) and Numbness (you can’t chain). 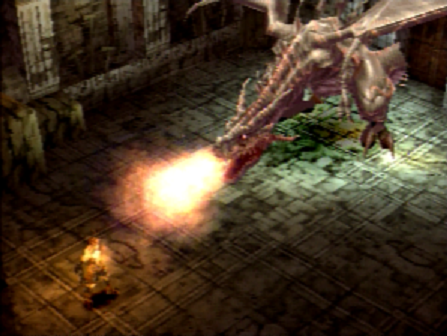 Boss battles are another highlight of Vagrant Story. Even the regular ones (e.g. you walk into a room, door closes, a giant dragon appears) are quite fulfilling, and story ones are just epic. While regular enemies can give you a difficult fight, bosses are almost universally hard and require some thinking, not to mention reflexes, to defeat. It’s great help to discover the boss’ weakness, as long as you’re able to exploit it. But chaining will usually be your main weapon – be it to stack up a lot of damage or reflect a percentage of a powerful attack’s damage back at the enemy. Once you win, a special win screen appears, appropriate music plays, and a roulette spins, giving you the stat increase it stops on. 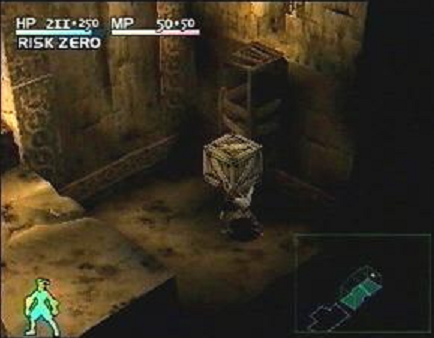 Last, but not least, the puzzles… The game features rather extraordinary cube puzzles, where you have to move different kinds of cubes around a room to proceed (usually, the goal is to reach a high place). The best part is that their difficulty also progresses as you move on through the game, with the last few ones being real thinkers and granting a very satisfying feeling when you solve them. There are quite a few different cubes – ones you can lift, ones you can just push, magnetic ones, ones you can or cannot destroy… You have to manipulate them craftily in order to achieve your goal. There is even a puzzle mode which activates once you go into a puzzle room you’ve already been to. The time you solve the puzzle in is recorded and you then try to improve it. If that’s not your thing, puzzle mode can be deactivated from the menu. Once you beat Vagrant Story, there is also a New Game+ option, allowing you to breeze through the game a second time (and as many further times as you’d like) and discover secrets you’ve previously missed while retaining the stats and equipment that you beat the game with. The first thing that strikes you as the game starts is that the cutscenes use the in-game character models, despite the game being on the system that made FMV cutscenes big. It’s not a new approach for the Ivalice team, as Final Fantasy Tactics only had a couple of FMV movies in the beginning and at the end of the game. In Vagrant Story, the only FMV is the intro that plays after the game boots. The approach works quite well, it keeps the consistency between gameplay and cutscenes, a feeling that’s always nice to have. The character models are detailed, and it’s also impressive how well their emotions are depicted on their faces, given the limitations of the PlayStation hardware. Another rather notable thing is the comic book-like balloons that characters’ lines appear in. It’s very important for a dungeon crawler to have good atmosphere, and Vagrant Story does relatively well in that aspect. The environments are just a bit repetitive, but the setting justifies that. You wander dark corridors, catacombs, undercity passages… It’s expected that there’s not that much variety in the way they look. On the other hand, the few outdoor places are pretty enough. It feels like a refreshment to finally come out in the open after a long period inside. I would highlight the forest area. PlayStation has always been known for its great JRPGs. 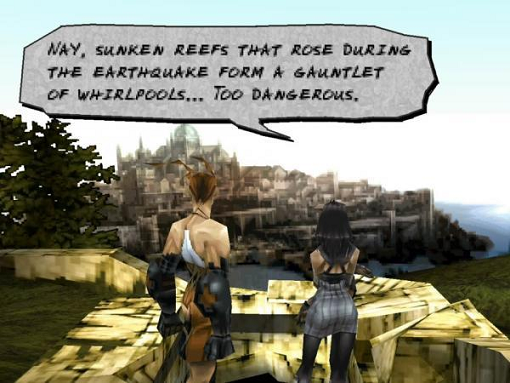 It was home to some of Square’s finest works. 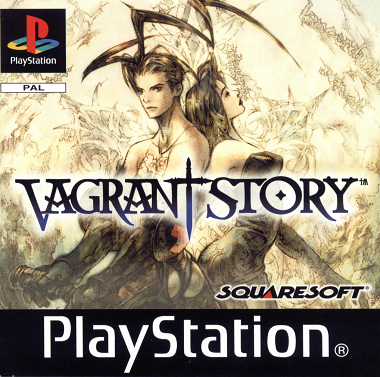 Yet, even being an RPG by Square could not bring Vagrant Story that much fame (even Xenogears is much better known). Aside from it simply not being a Final Fantasy, I guess it being so different from the traditional games in the genre also contributed to that. But it has a dedicated following that strongly desires a sequel. 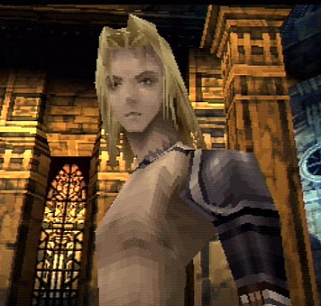 Vagrant Story is well worth a playthrough. It’s really fun once you get the hang of the gameplay, chaining hits is a thrill, the story is very good, with fascinating twists, and the game does not require a big time investment. Ashley, Sydney and the rest make for a strong cast that you will remember. The unique style and the level of detail in the character models will also keep you hooked, and there’s so much to play around with if you get into weapon crafting and development. The New Game+ option will allow you to visit areas you’ve previously missed and try to 100% the map. 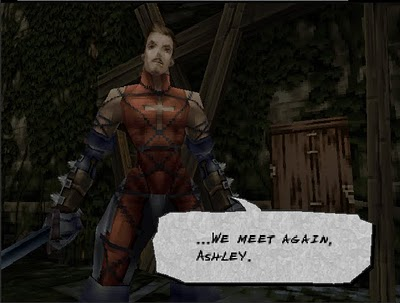 Vagrant Story is a solid package that I can’t help recommending to anyone looking to play a PlayStation RPG. Now that it’s also available on the PlayStation Network, you can access it easily. Definitely one of my favorite games when it came out. It deserves a sequel (certainly moreso than FF7, at least to me). I just wish the game was fully voiced like the amazing Metal Gear Solid and Soul Reaver. I agree with both points. I loved the level of detail in the character graphics (even if the environments were generally lacklustre, but, as I said in the review, that has a viable explanation). And a sequel could be very interesting, even if I’m not sure how it would work story-wise. But gamers certainly deserve another game with this unique gameplay.